Hire adventure equipment in Sydney from Bushsports for Canyon Wetsuits, Army Camouflage Nets and Netting, Abseiling, Bushwalking, Caving, Canyoning, Mountain Bikes, Touring Bikes and Adventure Sports equipment for Blue Mountains adventures direct to you. Bushsports supply and hire excellent adventure and event gear for accessing canyons, abseils, cliffs, rock climbs, rivers, white water, mountain bike trails and single tracks, eco challenges and competitions in Sydney, The Blue Mountains, Southern Highlands and Hunter Valley. Trial a professional Canyon wetsuit and have the adventure gear fitted or demonstrated before purchasing. ie Try before you go and buy. We design, build and supply themed props for Vertical Rigging, Events, Survivor team building activities, Amazing Races, Boot Camps. Obstacle Courses, Eco Challenges, Product Launches, Special Events, Corporate Entertainment, Functions, Army Themed Parties and Games. Call our team of adventure experts on T: 02 9871 3333 or email for a quote on gear hire rates for groups. The Blue Mountains is an exceptional adventure playground. We have hire gear to make your day comfortable. Canyon wetsuit hire – timing is perfect for wet canyon exploration and Li-Lo Rafting The Wollangambe River. 12 Mountain Bikes set up Trailer Hire in Sydney 12-14 Bikes, professional set up. Bikes upright wheels on – easy! Going Canyoning in The Blue Mountains this weekend. It is much safer and more comfortable with the right gear! Bushsports Canyon gear and Canyoning Wet suit Hire is available direct in Sydney’s Northwest – easy stop over off the M2 – Pennant Hills Road when heading to the Canyons. Save yourself the trip into Katoomba. Especially if your heading direct up the Bells Line Of Road to Mt Wilson Fire Station for The Wollangambe or Mt Tomah for Claustral Canyon and Mt Banks. Wet suit Steamers full length exceptional for cold canyon environments; ie Wollangambe Canyon, Empress Canyon, Claustral Canyon. We supply excellent quality Full Length arms and Full length legs Neptune Wet Suits. Made of Japanese 3.5mm glue and stitched Neoprene. Especially designed for canyoning adventure activities with the zipper at the front. To stop chaffing and back pack rub points. Neptune Canyon Wetsuits are high quality, Japanese Neoprene. Double Stitched with knee protectors and front zippered. With a insulating 3-4mm quality neoprene thickness you can select 3/4 length or full length wet suit hire. All sizes of canyon wetsuits available. From child of 10 years with small slim builds to extra large adult sizes for the big blokes. Far better than cheap imported neoprenes that may provide protection from hypothermia. We also offer and are selling ex hire 3/4 Canyon Wet suits along with Short arms, long legs with paddle cag top, neoprene cuffs and neck closure. Naturually we want to make sure you are decked out from head with our Adventure Helmet Hire – Flouro Edelrid helmets and Petzle Rockclimbing Helmets to waist with quality Canyoning Harness hire that has cordura canyon bum protectors for those fun and accidental slides into rock pools. We also carry Canyon & Bushwalking Back Pack Hire Cordura Base with canvas and drainage holes from 50-80 litre capacities. As a great package deal we supply a full Canyon Equipment Rig Hire including Carabiners, Figure 8 descender, Petzel or Edelrid, helmet and harness. Complimentary with the full rig hire we provide a 20 litre Canyon Dry Bag for dry storage of your valuables and first aid kits. Ex Army, professional camoflauge nets covering 6m x 3m. Great to cable tie in position to create an army theme party at home. Make your next party or event a professionally decorated themed. – Bargain for bike touring or just a cheap bike to ride to Uni or to work. Judy XC front Shocks for Hire & Sale $200-$300ea offers accepted, condition dependent. Rock climbing and Abseil Harness Hire Padded excellent quality adventure gear hire. Don’t waste your money buying before you know the adventure sport is for you. Hire it for safe experiences, great advice ideal for team adventures, tough mudder, tough bloke, spartan adventure racing, stampedes… by hiring your adventure equipment. Try before you buy and receive professional advice and experienced honest recommendations on adventure and mountain biking equipment. Need a guide, trainer for adventure activities, instructor, developing an adventure activity, eco-challenge, social or thrilling corporate activity? We know the requirements, Please Call us Phone: 02 9871 3333 to discuss your needs. 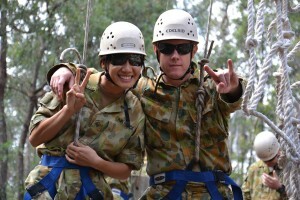 Bushsports adventure equipment hire based in North West Sydney. Kayaking, Canoeing, Canyoning, Mountain Biking, Riding, Cycling. Specialists in: Canyon adventure wet suit hire. Kayak or canoe hire, White water kayak hire and new is our Surf Ski Hire – elite ideal for training and or Racing events – drop off Training, Coaching and Tuition available. Mountain bike for the best sweet single tracks in and around Sydney. Adventure gear hire experts with professional advice. Available to design adventure events, navigation challenges, eco-challenges, obstacle courses, corporate entertainment,stampedes, displays, fully rig, provide vertical and industrial access, rig lighting, PA systems, build sets and instruct the activities – Australia Wide. Bushsports adventure equipment & canyon gear Hire is conveniently located in Sydney just off the M2 near Epping and Parramatta. Phone (02) 9871 3333 to book equipment hire pick ups. Bushsports staff provide friendly advice, setting you up with quality adventure equipment and gear to hire for Abseiling hire, Canyoning hire, Vertical Rigging, Indoor Events, Kayak & Canoe Hire, DOE (Duke of Edinburgh programs), Mountain Bike hire for the Sydney & Blue Mountains market. EQUIPMENT HIRE LOCATION – Epping / North Parramatta Area; just off Pennant Hills Road near M2. Easy pick up and drop off service in Sydney near Parramatta by appointment only. Bushsports adventure gear equipment hire is maintained in excellent condition. Minimum Hire Fee is $55. Group discounts apply on multiple days and large group adventure equipment hire. Multi day adventure and canyon wetsuit hire rates and equipment hire on large orders for adventure training groups, defence, army, airforce, scouts, girl guides, cadets, duke of Edinburgh DOE award, students, teachers, instructors, eco challengers, racers, activity group leaders, Australian defence training, training providers and not for profit organisations. Flexible Pick up arrangements and drop off or logistic support for adventure hire equipment. Pay only for the days you use the adventure equipment hire. 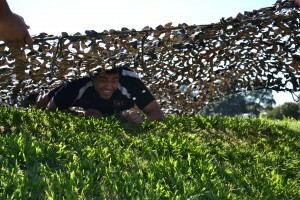 * Easy adventure equipment and Camouflage Net hire. Pick up in Carlingford / Epping area, North West Sydney. Delivery available for groups within Sydney, Blue Mountains, Hunter Valley, Central Coast and Southern Highlands from $50.